In the last few years, it has become increasingly popular to film movies, TV series and music videos in Iceland. In fact ever since parts of the 1985 James Bond movie View to a Kill was filmed in Iceland at Jökulsárlón the trend has grown fast. In the first years after the release of a View to a Kill, it was clear that Jökulsárlón was the most popular attraction to film. This movie is one of many, that was filmed by Jökulsárlón in South East Iceland. Here Angelina Jolie as Lara Croft sails on the lagoon that represents the Siberian tundra and Icebergs on the sea. If you would like to get a little taste of the experience there are two companies that offer boat tours on the lake. During summertime, they have several departures each hour. This is the second time James Bond visits Iceland but this time Jökulsárlón does not represent Siberia like it did the first time. This time around Bond attends a Gala party at an Ice Palace in Iceland. For this movie, the producers had to artificially freeze a part of the lagoon. Since it does not frees naturally unless extremely cold (colder than what happens in Iceland) due to its salinity. For this movie, they started to deviate somewhat in terms of locations for big movie productions but only by a little. This movie was filmed in Skaftafell under the largest glacier in Europe, Vatnajökull. That is only a 40-minute drive south of Jökulsárlón. Although filmed in Iceland the movie takes place in Tibet. If you are looking to enjoy this kind of scenery there are tours that can be taken upon Svínafellsjökull where the above scene is taken. This Clint Eastwood movie was filmed in the Reykjanes peninsula. The first place most visitors arriving in Iceland see. Although the scenery is Icelandic the movie takes place in Japan. In fact, these black sand beaches are far more peaceful than they look in this wartime movie. A movie based on the Jules Verne classic novel where the entrance to the center of the earth is said to be through Snæfellsjökull volcano. Sadly the movie is not quite as classic as the novel it´s based on. But in its favor, it features some great scenery. For those of you traveling to Iceland, the Snæfellsnes peninsula has some stunning places and interesting things to do. Like taking a tour into a lava cave from the Snæfellsjökull volcano. In this one, Ben Stiller as Walter Mitty goes all over Iceland on his journey across Greenland, Iceland, and the Himalayas. Although place names in the film are not reliable the film features spectacular scenery from all over the country. One of the most stunning scenes from the movie is when Mitty glides down a bendy mountain road. This is according to the movie placed in West Iceland but it is in fact filmed in Seyðisfjörður in East Iceland. It is quite fitting that a movie about the Nordic god Thor would be placed filmed in Iceland. After all, he was one of the gods of the Icelandic settlers. Scenes from the movie are filmed both by Skógarfoss waterfall and in the stunning highlands of Iceland. The biblical story is framed by Icelandic landscape such as black sand beaches and mountains. Yet another star-studded movie filmed in Iceland as Russel Crow, Emma Watson, Jennifer Connelly and Anthony Hopkins played major roles. Another comic based movie filmed in Iceland just like Thor. In this case, the scenes form Winter Soldiers land in Siberia were filmed near Vik in South Iceland. And lastly, there is the latest installment of the Fast and Furious franchise. It came out in 2017 and filmed speed chases on the frozen lake Mývatn and tanks driving on the streets of Akranes village. A few TV series have also been filmed in Iceland. Some entirely and others in some part. This is the first large TV series to film in Iceland, and boy has it been successful. Several places in Iceland make up the land North of the Wall. Places such as Þingvellir national park, areas of the south coast near Mýrdalsjökull glacier as well as Lake Mývatn and Dimmuborgir in the North-East of the island and Djúpalónssandur in Snæfellsnes peninsula. Not to forget that the series famously includes Hafþór Júlíus Björnsson, Iceland’s strongest man as the Mountain. This TV series is meant to take place in Svalbard but was filmed mostly in Reyðarfjörður fjord in East Iceland for the first season. 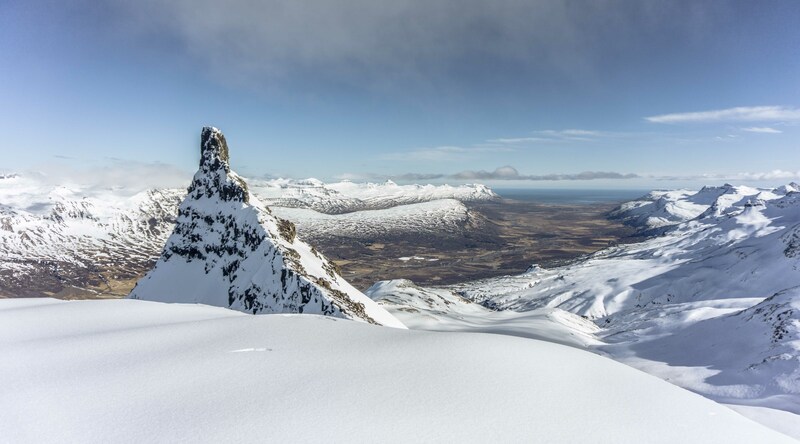 And now that the second season went into filming last winter they have filmed some parts in the surrounding mountains, Seyðisfjörður and Eskifjörður. This series also includes many Icelandic actors. Many of them as extras and a few as permanent characters. If you want to get to know East Iceland check out our tours by car, boat, bike or foot. This is the only Icelandic production on this list. But since it was produced for an international market it gets to go along. The series takes places in Seyðisfjörður fjord in East Iceland although most of it was filmed in Siglufjörður in North Iceland. It gives light to the hard winter conditions that can occur in Iceland. But don´t worry the murder mystery is entirely fictional. On the rare occasion that we do get trapped, we can just get cozy inside and relax. 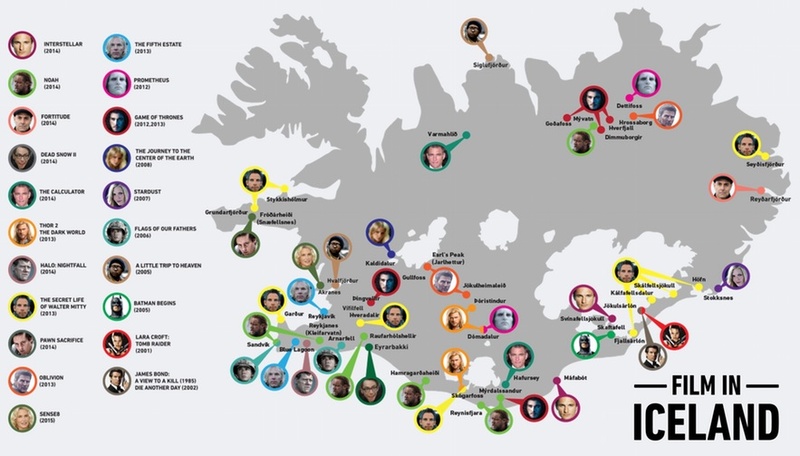 We can’t forget how celebrities like the Kardashians help get Iceland on the map. This year Kim, Kourtney, and Kayne West came to Iceland and filmed an episode for Keeping up with the Kardashians. The episode aired on July 10th. This list is by far not exhaustive, you can find more on the Film in Iceland website. Lastly, the music industry hasn’t fallen far behind and here are some examples of music videos filmed in Iceland. Filmed mainly in South East Iceland it also uses elements from Icelandic culture and history. This one uses stunning black sand beaches and dark rocks as a dramatic backdrop for a song of love and loss. With a lake and mountains in the background, this scene is just as dramatic as the last one. This song is filmed in the Icelandic highland. Although the hunting plot does not resemble Iceland it takes great advantage of the scenery. Left for last due to Bieber’s less than exemplary behavior in the video. It surely shows some stunning landscape but many of the things he does in the video are either dangerous or destructive to Icelandic nature. The list of thing you should not mimic from his behavior is too long to go over it here. Check out this blog that goes over it in detail. Isn’t now a good time to rent your favorite movie and daydream about a trip to Iceland.